I'm not going to lie, this month has been the hardest month in my MFA program so far. The way the Bennington Low Residency program works, we meet twice a year for ten days in Vermont and in the intervening time we work one-on-one with established writers on our own material (I'm working with Dinah Lenney this term, and got to work with Susan Cheever last term--both amazing writers and amazing teachers). Every month we're responsible for reading 4-5 books, writing two annotations--which is what fancy graduate school calls book reports, and we submit 15-20 fresh pages of work, along with the revision of one of the last month's pieces. Altogether, my Bennington peeps and me, we call this stack of work a "packet." Packet #3 of 2nd Term is killing me. I'm going to start with the essays I've loved, because they feel like they might be more widely appealing. They are all low-investment (relatively short compared to a book, and free) reading options that will challenge you into a better place from sentence #1. Plus, if you have not seen the plural of "Prius" written on the page, you will find its appearance "prii" hugely satisfying. What has Irony Done for Us Lately, A Place Journal: Calling all Pam Houston fans: she has a new book on the way, and some gems from it are being released as essays. This one must be read with tissues, but you won't be disappointed. Bennington peeps, read to experience our beloved Josh Weil with a thirty pound elk baby in his arms. I'm Drowning in Whiteness, Ijeoma Oluo, Kuow.org: Fellow white people, we have to read these pieces. What comes up for me and what I'll be thinking//writing about more, has to do with what white supremacy has stolen from all of us. It should be obvious by now that non-white people live more dangerous lives in the US. And we should be furious about that. But if we think that white supremacy mostly does a disservice to other people, we are missing the point. These cultural separations are robbing us all of us. I Need to Talk to Spiritual White Women about White Supremacy, Layla Saad, wildmysticwoman.com: The biggest lie white women have been sold is that we are our most successful when we are being nice, that and that love looks like something from a Hallmark card. Fury is love that demands justice, and you've been told you have no right to your own fury. The world needs us to find our fire, ladies. 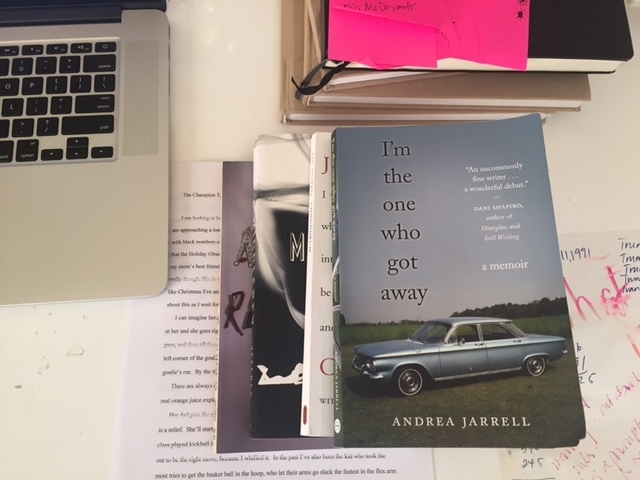 I'm the One Who Got Away, Andrea Jarrell: A memoir exploring the contours of the writer's desire across the span of her life. Without mentioning the word misogyny, she nails the complex problem of women's desire in the patriarchy. Has a great ending. Plus she got her MFA at Bennington--WOOT! The Most of Nora Ephron. Like Conundrum itself, Ephron's response continues to be the scaffolding behind a lot of political pushback towards transpeople. Middlesex, Jeffrey Eugenides: Confession. I haven't finished it yet. But so far, this is the most writerly example of a gender nonconforming experience I've come across. That said, the author is not gender nonconforming himself, which doesn't mean he shouldn't write it, but it does mean that I think he has to have some of the same problem I do trying to feel into the experience. But, the guy is a masterful writer--which accounts for a lot. So more on this to come. Some Assembly Required, Arin Andrews: A FTM trans memoir written by a young adult right after transitioning. Includes very explicit information that most trans memoirs do not directly address. Written for other teens considering transition and does a lovely job of addressing the overlap between gender identity and sexual orientation. From a distance we are taught that these two topics are separate, but in this first person account it's clear that for this individual the two topics are intimately tangled together.